Before you even consider a pet pig it is a MUST to make sure that where you live is properly zoned for pigs. Pigs are considered exotic or livestock in many counties/cities and you need to make sure that they are legal to keep within your city or county's limits. If you obtain the pig before doing this research, there is a high probability that the city will take your pig away from you. This is devastating and another reason pigs end up in rescues or shelters so frequently. Every city within a given state has different zoning regulations, these regulations can even change year by year. So just because a pet pig was allowed a few years back, it does not necessarily mean that you will be allowed one now. So make sure to call your city before deciding on a pet pig! If someone in the city office tells you that you ARE zoned correctly or that pet pigs ARE allowed, write down their name, date and the information you were told. Go even further than that and get it in writing. Find the ordinance and be sure it clearly states that you can have a pig(s). If some one makes a complaint against your pet and you come to find out you were given misguided information, having all these details may just ave you and your pet pig! Click here to help you find out whether or not there is an ordinance in place for your area. No one that rents should add a pig to their family without a written consent of the owner or management company. This is to cover both parties in the event of the pet destroying something in the home or apartment. If your landlord agrees to a pet pig, get it written in an official letter or amendment to your lease. This is to protect YOU and your pet if all the sudden the landlord decides he wants to change his mind. Be very clear on the details of what they will allow and an appropriate pet deposit. You want the deposit to actually be appropriate for a pig, in the instance your pig does accidentally cause a lot of damage to the home/rental property (this CAN happen even more so than with destructive dogs). Pigs really don't make good apartment pets, contrary to what a lot of breeders will try and tell you. Pigs are naturally destructive because of their natural need to root and can tear apart your home in a few hours. We have known first hand, pigs that have ripped up carpet, open fridges and raided them, open/destroyed cupboards, ripped up clothes, beds, pillows, couches and have even chewed the walls and baseboards. Also keep in mind that if you plan to continue to rent and need to move, you may have a difficult time finding another rental property that allows a pig to reside in the home. 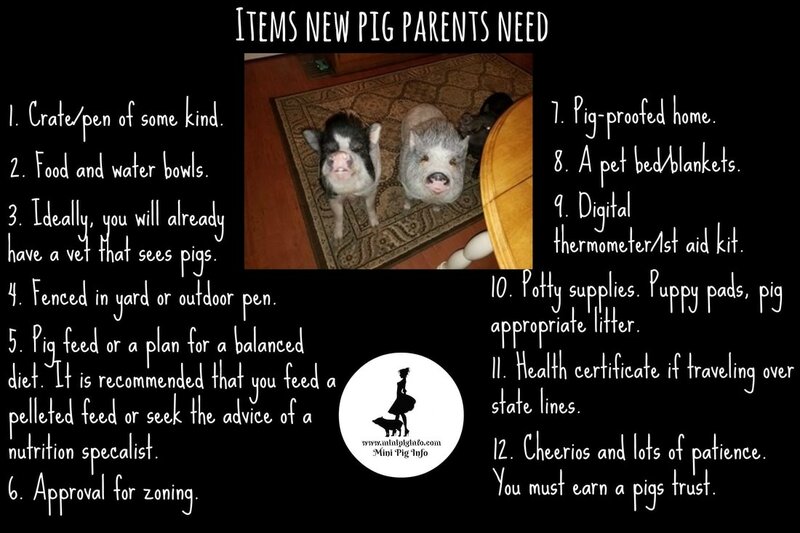 Although not all pigs do this, you have to expect and plan for a pig that will need patient guidance and training to become a good house pet. There is a subsection that discusses how you can find out if you're zoned to have a pig in your particular area. If you live in an apartment and you're not on the first floor, remember, even as a piglet you will have trouble carrying your pig up and down the steps because they don't like to be restrained. Once your pig gets older, your pig will also get much heavier rendering it almost impossible to carry up and down steps. Pigs don't usually do well with steps, their center of gravity is different than other animals, pigs tend to place most of their weight on the front 1/2 of the body and this makes steps tricky for them to maneuver. There have been several pigs who have fallen down steps and ended up with fractures and some have even required surgery to correct the defect. Click here to read more about stairs and pigs and the potential dangers. Needs to be confined to a small area/space, especially when first brought home. We recommend crate training as this will be important when the need to transport your pig arises. A crate provides your pig with a secure spot that he/she can feel safe in and also provides you with a sense of security, that your pig isn’t roaming freely through the house. Do we recommend your pig be left in a crate all the time? Of course not, but crate training will provide you with a safer way to contain and transport your pig when it grows bigger. Potbellied pigs can be territorial. If they are to be kept indoors, they need a defined space (such as a portion of a laundry room) with a sleeping and eating area in one corner and an elimination area in another. A large litter box with one side cut down to accommodate easy entry and exit often works well. Be sure the litter used is nontoxic; dry dirt or pine shavings are appropriate choices. Potbellied pigs are not only curious, they tend to chew on everything. Providing a blanket to burrow under or a box of dirt to satisfy the need to root will go a long way toward protecting your home furnishings. Their uncanny physiological and behavioral similarities to humans have given pigs a mysterious and often mythical quality that lends itself to folklore and fables. Pigs were once considered wicked and dirty, but science has helped to shed light on the depths of their remarkable cognitive abilities and to extend a greater appreciation for these often maligned and misunderstood animals. Ideally your pig will have access to the outdoors and will be able to potty outside, however, depending on where you’re located and the time of year, sometimes this just isn’t a possibility. So litter boxes are sometimes a necessity. Pigs can be trained to use a litter box much like any other animal is trained, be patient, and expect accidents. If your pig eliminates itself on the floor, simply pick your pig up, place him in the litter box and use a consistent word like “potty” before and while the pig is in the litter box. Picking up its waste products and placing them in the litter box also provides them with the scent and reminds them to go to the litter box to potty. For boys, they urinate under their belly. Girls however, urinate from behind and often have a stream and sometimes litter boxes don’t capture any or all of it. For smaller pigs/those under a year, we recommend a high backed Ferret litter box that fits in to a corner. Your litter box selection does need to have sides. The litter box also needs to have some kind of traction, so a cat box may work in the beginning as long as the bottom is scuffed up and it isn’t too slippery. This can lead to injury if your pig is constantly falling down in the litter box, so just watch and make sure they don't struggle with this issue. Once your pig grows and no longer fits in a regular type litter box, we suggest getting creative! We have heard of people modifying large Rubbermaid storage bins, using large oven drawers or drip pans (they are more shallow and older arthritic pigs can get in to/out of them easily), or even large home made wood boxes. Remember, it has to work for you and your pigs unique situation. When they grow, stay safe but get creative! Pigs are herd animals, therefore, if you only have one pig or are a single pig family, then your pig considers you to be part of their herd. A pig needs to know its place in the herd and will test this often. Move the pig is a technique Lydia Weaver (pig behavior expert) wrote her MTP (Move the Pig) article on. To summarize her theory, basically, you wait for your pig to get comfortable and lay down, you then go to the pig and physically make the pig move to a different spot. This sounds cruel, but what it actually does is teach your pig that what you say is the rule, period. Some pigs may swipe their heads in protest, while others just simply move to another spot. This must be done consistently until your pig learns he/she is not the boss. If you have an aggressive pig or one who bites, it is recommended that you use a sorting board or something similar to create a barrier between you and the agitated pig. Pigs love to learn, they are eager to investigate, search and find new things. This doesn’t always work in your favor though. Because pigs are naturally curious animals, they tend to get into things that you may not want a dirty snout in, which brings us to the next topic of discussion...pigs need activities, they need time outside to be a pig. Pigs can be happy with rooting boxes (a homemade or store bought box) filled with ball pit balls or river rocks, toys, dirt, whatever you'd like to put in there that a pig can't get hurt rooting around in. Throw a few treats in like Cheerios, oats, grapes, etc... and watch your pig search for every single piece of food that may be in there. Click here to read more about enrichment activities for your pig. *Remember, each pig will have its very own unique personality and each situation will be different. If you find yourself asking why you ever got a pig, you're not alone. I think we have all been there, but there are people who can help you. Sometimes its not a one solution fits all for your particular problem and you may need a more individualized plan to correct your pigs behavior. Don't give up, please let us know and we can put you in touch with people who can help. And also keep in mind, indoor pigs need outside time too. Pigs need to act like pigs and having a safe outside area to do that in is paramount to successful pig ownership. Instinctively, pigs are herd animals and prey animals, so when they're scared, they run and when I say run, they run fast to get as far away as possible from whatever has frightened them. They can cover a lot of surface area when they're running, so if you have a new pig, you want to put them down in secured areas, not in an area without fencing. Remember, if you are getting a pig from someone else and they're claiming the pig is socialized or potty trained and you are not finding that to be the case, keep in mind that your home is different from the home this pig came from. The rules are different, the people are different, the routine is different. They need time to acclimate. Click here to learn more about pig behaviors. Most pigs are scared when they first arrive. Keep in mind they're leaving their family, their mama, brothers and sisters, so not only are they moving to a strange place, but they're also leaving everything they know behind. 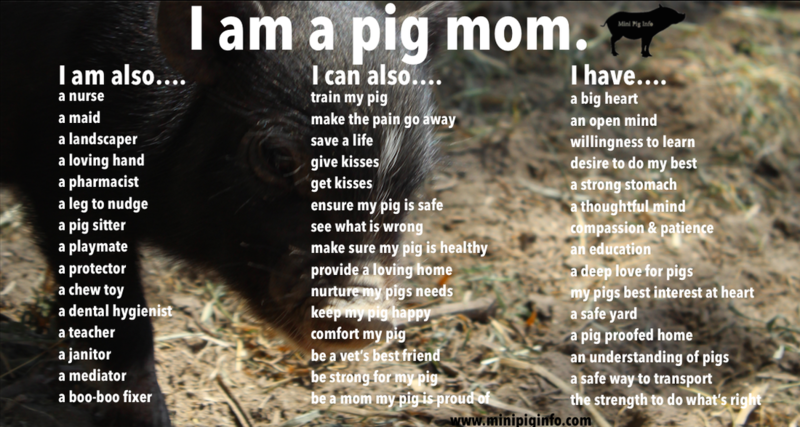 Click here to read about how to introduce yourself to your new pig in a way that isn't terrifying. 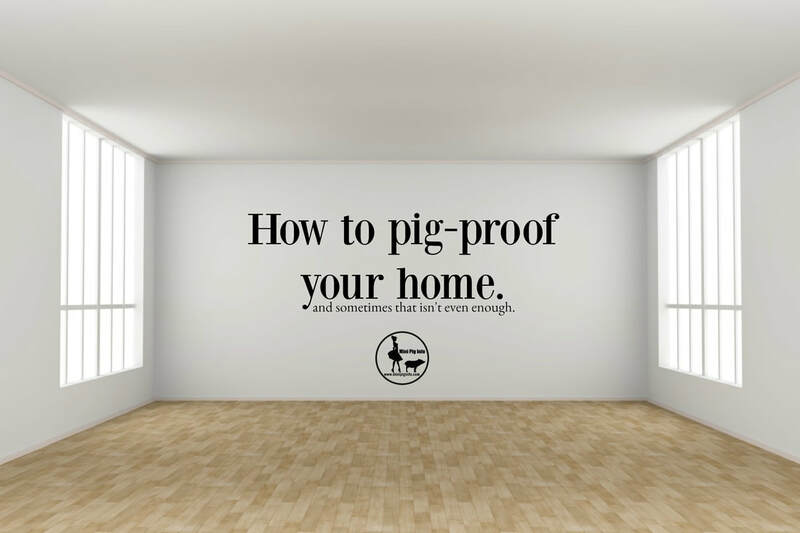 In order to truly "pig proof" your home, you will need to get on your hands and knees and see what is at their level; It’s very much like baby proofing your home. Pigs don’t know something may be dangerous or harmful to them, they just want to taste it, play with it, take it to their sleeping area or tear it up. Depending on the age and size of your pig, he/she may be able to jump much higher than you expect. We don’t encourage jumping, their bodies are not designed for this and over time can wear down the joints and cause other medical complications. We do recommend that you have a “pig” area, whether that be a crate, a special room, or even a designated spot that your piggy can call its own. This will eliminate any confusion the pig may have about where they sleep, eat or potty. Cabinets, refrigerators, purses, pill bottles, closets, shoes, curtains, piles of clothes, candles, crumbs on the floor, dog food, cat food, bird poop…nothing is an exception. Pigs will eat anything! Please make sure there are no mice or rat poisons where the pig can get to them, make sure all medications are put away, make sure any and all cords are out of reach of your pig; they will chew on cords and if something is plugged in and your pig chews that cord, it is very possible your pig could be electrocuted. There are some house plants that are toxic to pigs, poinsettia’s being one that’s fairly popular around Christmas time. It only takes a second for your pig to get into something he or she shouldn’t have and then things can turn tragic very quickly. Child proof locks, locks for refrigerators, have been relatively successful for keeping them out of areas they shouldn’t be in. Baby gates are fairly reliable at keeping them contained in a a particular spot. But only the ones that screw into the walls, the ones that are held up by tension only are usually no good. They will learn very quick how to remove or get past those by leaning and rooting on them. Bored pigs turn into destructive pigs, so not providing them with activities that keep their minds busy will result in a pig who is eating carpet, walls or knocking down trashcans, etc. We did make a pig shaming video that you can watch by clicking here. The point of this video was to amuse everyone, but also show those who are new to pigs what pigs are capable of. They will get into EVERYTHING! So very important!!!! Exercise needs to be balanced with an appropriate pig diet. Pigs can become obese super quick and it’s extremely hard to get the excess weight off of them. They need to run, play, dart around and be a pig. They need an area big enough to accomplish this though. A small pen the size of a crib isn’t sufficient room for your pig to be active. They need a large area to run and play, they need to go out and be a pig, root around in the soil, eat worms and do what pigs do. A pig who doesn’t get to exercise will become lame, likely obese and develop further complications from obesity. It is proven that they also need the mental stimulation that being outdoors and having the ability to behave like a pig offers. They need to release energy like any child, providing them with a safe place to do that in is your responsibility. A fenced in yard is ideal as pigs are pretty quick and once they’re determined to run, they sometimes keep running no matter how many cheerio’s you have or bags that crinkle, they’ve smelled freedom and won’t come back until they’re ready to. As stated before, pigs are herd animals. So what other pets that are living in the home, become part of the herd. Pigs are prey animals and by nature are scared of noises and other animals, because their instincts tell them to run from them. Dogs on the other hand are predators and because of that combination, combined with the fact that pigs have no defense against the canine teeth of a dog, its not a good combination and actually an accident waiting to happen. I see stories all the time about a pig who has nipped at the dog, or stories where the pig is playing with a dog and ultimately they all end up with the pig paying the ultimate price. The pig always loses, they don’t stand a chance against a dog even though they’re typically the ones who initiate the fight. They still end up suffering the most, sometimes even killed. I’ve seen cats and pigs do well together, while a cat may scratch a pig, typically the pig knows to run away or leave the cat alone whereas a dog, will stay and fight. Birds seem to do well with pigs also. Horses and other livestock don’t typically do well with them. Because pigs always want to be the boss, they tend to make barnyard enemies. If you have a large variety of animals, you will be the best judge at which ones are more docile and can happily live in harmony with your pig, but please don’t ever leave dogs and pigs alone…not even for a minute while you run in the house to grab something. In that 30 seconds you’re gone, your dog could have torn the ears off of a pig, ripped open the skin around the neck, punctured holes all over the body and even worse, killed your precious pet pig. It’s always better to be safe rather than sorry. Click here to read about pigs and dogs. Horses and pigs do not typically get along well either. There have been several instances where the pig will nip at a horse and injure the horse, but again, the pig loses that battle too, a horse is much more agile and also very strong and can easily injure or kill a pig. Their fear of pigs causes panic and if them being together can be avoided, that would be best. Pigs do better in pairs, having another pig allows them to have someone else they can communicate with that understands their language. An older pig can typically get along with a younger one, a rescue pig can usually learn to tolerate a spoiled single pig. All of this takes time and introducing new pigs is another subject altogether and will be covered in a different section of the site. But given the right amount of time to get used to each other before introducing them face to face, they typically end up being the best of friends. Having a second pig can help not only keep a pig company, but also lessen the bored pig syndrome and hopefully lessen the destruction from a bored pig. (Some pigs will get into trouble when they're bored, having a second pig gives pig #1 someone to "talk" to therefore lowering the boredom level) Cats seem to be a great fit for most pigs. Below is Anna Davis Key's (Vice President of PAL~Pig Advocates League) pig and cat best friends forever video. Click here to read about our pig friendships blog. Some pigs do well with baths, while others prefer not to get in the tub. It is really about introducing bath time early on and making it a pleasant time for your pig. Many use cheerios to entice their pig to get in the tub and others have used peanut butter smeared on the side. My pig has always enjoyed bath time with the exception of her very first bath, but not everyone is that lucky. Use baby shampoo that is tear-free for the best experience for your pig and be sure to moisturize afterwards. Depending on the season, also use sunscreen once bathed, as you have washed away any debris that may have been used as a natural sunblock to protect your pigs skin from the harmful sun's rays. Read more about bathing your mini pig by clicking here. I do understand many pigs are NOT a fan of the bath, so you can bathe outside in a kiddie pool when appropriate, use a rubber brush to get the dried dirt and even mud off, also improving skin by removing dead skin and flaky skin. The DIY pet washing station can be useful IF your pig is agreeable. I would be irresponsible if I didn't mention the water that would point at the ears would need to be eliminated from the overall idea. Pigs have very sensitive ears and if only one drop gets in, they can develop a head tilt that usually lasts a day or two....but it is extremely uncomfortable for them. Some pigs do well with kids, some do not. Each pig will have a unique personality, sometimes they are docile while other times they are not. Some pigs love to cuddle, while others just want to be left alone. The more you socialize them while they’re young, the easier it is to introduce new people to your pig. If you’ve rescued or adopted an older pig, it’s not too late, you can still socialize your pig! It may take some time to build the trust (depending on the prior living situation or if it involved neglect or abuse), but pigs are naturally social animals, so they typically love attention and belly rubs. We don’t recommend having a new baby and getting a pet pig at the same time. Both require a lot of time and attention and because pigs are always looking to move up in the herd, they often challenge children to take the higher spot. Children, that are able to, also need to participate in "move the pig" and be involved with the day to day activities in order for the pig to treat them with respect. Pigs will always pick the weakest link in order to move up in the herd, typically children are, in fact, the weakest link. So please be sure to involve the whole family whenever possible with the day to day interactions so your pig respects everyone in your family. This topic will be discussed in much greater detail in another section of the website. There are several name brands of pig feed. Mazuri being one of them. Purina makes a feed called pig and sow complete, this feed is manufactured for production pigs and isn’t recommended for “mini” pigs. Mazuri is manufactured for mini pigs and the company has compensated the feed, based on owner’s adding in vegetables and other sources of nutrition like treats. While Purina Pig and Sow is intended to be the only source of nutrition and intended for rapid growth. Champion, manufactured by Ross Mill Farms is another brand of feed, Manna pro is another, Ranger's Refuge (a pig rescue in Virginia) has a feed of their own; So there are many options to choose from. Other foods that are acceptable are most vegetables, green leafy vegetables typically provide the roughage needed in their diets while zucchini and watermelon for example, provide nutrition as well as hydration. Click here to see a list of pig approved fruits and vegetables. Sugary or salty foods should be avoided if possible, because their bodies don’t process them well. There are a lot of people who are feeding a natural diet that have no processed feeds added. Nuts, grains, fruits and vegetables and essential oils and vitamins/supplements are fed versus a commercial mini pig feed. Click here to go to our nutrition section for additional info about diets. *Please note that we recommend as a staple diet, your pig should always be fed a form of mini pig manufactured feed and according to the labels instructions. This should always be your pet's mainstay diet unless you are very familiar with natural diets and the nutritional requirements/caloric intake your pig will need in order to have a balanced and healthy weight. Natural, organic and hand made diets only, can be very complicated and research needs to be done before attempting to fully switch your pet over to that type of diet. Please click here to read more about natural diets. Before you bring your pig home, you’ll need to make sure you already have a few items. A containment area. Whether you chose a crate or smaller room of your house, you will need an area that is designated for your pet pig. A bed or area to sleep. Pigs do well with dog beds, but some pigs root on them so much that they tear them and once they’ve heard the sound of something being ripped, they want to rip everything they can find. I suggest an egg crate bed that can be bought at Walmart or Petsmart to start off with, some of the other beds contain lots of smaller pieces inside and that a subsection of pigs, who like to hear the sound of things being torn apart, will also likely try and eat the contents. So the lesser amount of pieces inside, the better off you are until you know how your pig will do with beds. I use a memory foam bed, it was quite costly, but my pig doesn’t tear her beds to shreds and this bed has enough body to support her weight. You will need food and water dishes. Spill proof bowls are the most ideal because pigs tip everything over. If you’re feeding inside the home, make sure it’s in an area that is easy to clean up. Depending on how you plan to potty train, a litter box or cloth puppy pads. (the reusable type because they simply tear up and try to eat the disposable kind, in my experience) Click here for potty training tips. You’ll want to order a harness and harness train your pig. A dog harness doesn’t work on a pig. Pigs have a funny shape and although a dog harness will fit, because of the neck size and belly size, when a pig tries to back up and you’re urging them to move forward, they can very easily slip out of the dog designed harnesses. There are multiple websites to buy a pig harness from. Click here to visit our recommended pig product page. You will want to have your pig food already at home before you bring your pig home. Pigs always act hungry and like they haven’t eaten in 2 days and in some cases, that’s accurate. Follow the directions for feeding that are directly on the bag of feed. Canned 100% pure pumpkin will soon be something your home is never out of! Canned pumpkin can be used to entice your pig to eat, maintain good bowels, act as a binder if your pig has diarrhea or more of a stimulant to help the body eliminate waste more efficiently. Click here to visit the nutrition section that includes the type of pig food you will need. You will want to have a digital thermometer that will be used rectally. So it will need to be separate from the family’s thermometer. (And labeled so it doesn't accidentally get used by a family member).Check a baseline temperature so you know what is normal for YOUR pig. Click here to visit our pig health section that includes common diseases & illnesses. You’ll also want to make sure you have a vet that will see your pig, already lined up. You will want to make an appointment for soon after your pig arrives, to ensure the health and vaccinations (if this is something you and your vet determined are necessary). Some city/county ordinances mandate vaccinations, so make sure to check first. Click here to see a list of vets that see pigs by state. I always recommend a crate, not only to protect your house, but also to protect you pig from household items they shouldn't put in their mouths. Pigs will try everything, some items are toxic or others are able to pass through the GI system causing a blockage or creating other emergent situations such as obstructing the airway or choking. Click here to read more about items/substances that are known to be toxic to pigs. These are things that should ALWAYS be out of their reach. Fenced in area/outside containment area of some kind or rooting box so your pig can be a pig and dig and play. You can click here to visit the section with outdoor, as well as indoor, enclosure ideas. An outdoor enclosure needs to be free from drafts/wind and have adequate insulation like straw, hay or thicker shavings. 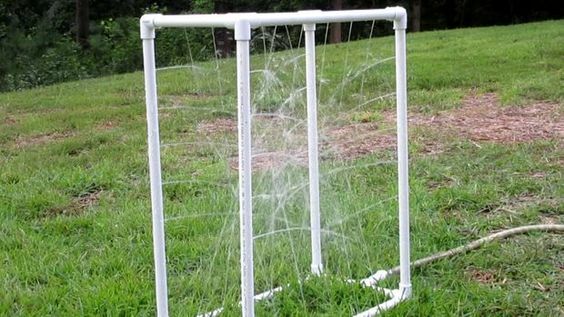 Fencing needs to be permanent fencing and not chicken wire held together by zip ties. Pigs are extremely smart, strong and will learn quickly where the weak spots are in the fencing. They will keep attempting to get to the grass that always appear greener on the other side, they will find a fences weak spot! They will always try to get out and roam if they are not spayed or neutered. There are lots of pigs that live outdoors full time, in my opinion, pigs prefer this versus living in someone’s home. So although the weather may be cold and there may be snow on the ground, as long as their outside enclosure has something to keep them warm and isn’t directly on the dirt/ground, they will do fine outside. Many have had to transition their indoor pigs to outside and as heartbreaking as it is to do, most pigs are much happier when this happens. There are also heated water buckets for winter that can be purchased to avoid water deprivation which can lead to salt toxicity and other similar issues. Same goes for the hotter months, pigs do fine as long as there is a place for them to go to get out of the sun or cool off. Many provide a kiddie pool or area where they can roll around in the mud, this is called a wallow hole. The mud is used as a natural protectant for their skin, much like a human sunscreen product, it helps in keeping UV radiation from burning them. If you have a primarily inside pet pig, you will need to apply sunscreen to avoid them from getting sunburn. Also ensure there is ALWAYS access to fresh water. Please make sure you pig proof your yard much like you did your house. Containers of old oil and antifreeze need to be removed. If you have a garden, your pig will get into it and eat your seeds or veggies, so be warned! Please take note of toxic plants they may encounter outside and remove them or create a strong barrier between your pig and those items. Try and remove any acorns or acorn producing trees from your pigs outside area, this is a debatable subject. But when eaten in massive amounts (which pigs are known to do) acorns contain tannins which build up and cause liver and kidney problems in pigs with a sensitivity to it. Make sure crawl space doors are secure, it’s not unheard of for a pet pig to open crawlspace doors and get under the house, then eat rat poison or anything else that may be down there including dead rodents, spiders, snakes, etc. You will want to choose an area that protects your pig from getting out and wandering free, but also to protect your pig from predator animals being able to get in to the area and do harm to your pet. A large pen equipped with a structure, such as a large dog house will provide a safe sleeping place and area to seek shelter from the elements. You should allow at least 50 square feet per pig. Pigs will instinctively eat and sleep in one area and defecate and urinate in another. Daily removal of feces and the addition of fresh dirt to cover and absorb urine are required for both the good health of the potbellied pig and the control of odor. Hay or straw may be added to partly satisfy the pig's need to root. Fresh dirt should be added weekly or more often if needed. Fencing should be well secured in the ground to prevent it from being “rooted up.” Fencing should also be removable, as the entire pen should be relocated periodically to prevent the buildup of wastes in the soil and to provide “new ground” for rooting. The old pen dirt should be smoothed out so that it is even with the surrounding soil surface and left unused for several months. If pens are maintained on solid surfaces (such as concrete pads), feces and urine should be removed daily, and fresh hay or straw provided 3 to 4 times per week. Water dispensers must be secured to prevent spilling or damage to the dispenser by chewing. Click here to see fencing, outdoor structure as well as containment solutions for indoors. Pigs thrive in any temperature. In the US as most places, we have seasons and although they may prefer one season over another, there are pigs all over the world that have adapted and lived in pretty excessive temperatures of both kinds. If it will be extremely hot, make sure the kiddie pool is full of nice clean cool water and water bowls have fresh water; maybe drop a few grapes in both to entice more drinking of water. Water dishes and kiddie pools should be cleaned daily if not twice a day in extreme heat! In the wintertime, use heated water buckets or warm water when feeding. Add warm water to your pig feed and add some oatmeal to add a little extra warmth….I do not recommend heat lamps because when used around flammable materials and unsupervised they have caused tragic fires. If you have little babies that can’t regulate their own body temperature, then heat lamps may be acceptable under a well supervised eye. There are alternatives out there for bigger barns or enclosures and even some that are designed for smaller spaces, but you’ll always need to check the safety regulations with the manufacturer. Potbellied pigs are very sensitive to extremes of heat and cold and should be provided a clean, dry, draft-free environment. Adults are usually comfortable in a temperature range of 65 to 75°F (18 to 24°C). Because pigs do not sweat, temperatures above 85°F (29.5°C) are stressful for adults. Extended exposure to high temperatures combined with high humidity may be fatal. Potbellied pigs are more susceptible to disease when kept in stressful environmental conditions. In general, the younger the pig, the more severe the impact of environmental stress. Click here to read more about seasonal issues including summer and winter months and how to ensure your pig has the appropriate space for the conditions. · Temperatures between 40 – 80oF (60-75oF ideal for adults and 80-85oF for piglets (Normal body temp 99.5 - 1010 F vs average farm hog 101- 1030 F). · Warm, dry sleeping area with a “bed”. Straw bedding or grass hay works well. · Pigs see very poorly so anything that moves in the distance could be a predator until they get accustomed to their environment. Pigs don't typically like to be held, but at some point, you will probably need to pick them up. Be prepared. Be prepared for the loudest noise you ever imagined and then multiply that by 100. Pigs like to feel secure and are much easier to pick up and hold when they're young. Ensuring the feet are tucked underneath of them usually helps with the initial fear a pig has when being held. Hold your pig close to your body to make them feel even more secure. Remember, pigs feet don't naturally leave the ground unless they're being consumed. So it is unnatural for a pig to be held. They will fight and scream because it is outside of their comfort zone. Never pick up a pig by the front legs or back legs. Do not pick up a pig using one hand. Always use two hands, one under the front two legs and one just behind the back legs. Keep your pig close to your body. Until you know how your pig will act, do not put your fingers or face up to your pigs mouth, you may get bit. The greater the restraint the more upset the pig becomes and the more difficult it becomes to perform the examination or procedure. Vocal and physical contact including scratching the pig along its back or sides has a soothing effect. Commercially available sorting boards or boards made of plywood is good for trapping the pig in a corner in order to give injections or to steer it into a kennel for transport purposes. We often make use of a calf cart to transport the pig from the stall to the operating room. A bucket over the pig’s head facilitates backing the pig into the cart. Flipping pigs over on their backs facilitate carrying out small quick procedures such as foot and tusk trimming and vaccinations. In order to do this the pig is pushed up against a wall with a board. The board is held slightly off the surface in order to reach the front and back leg furthest away from the operator. The legs are pulled out from under it in a single swift motion without hesitation. One person stands behind the pig and firmly grabs the back legs while a second person straddles the pig hold the front legs and squeeze the pig’s neck between his legs. In large pet pigs, which show aggression a dart gun can be used. The pig should be darted in the back of the leg after which they usually just run a few yards. This is Reed Bryant, a piggy friend, who playfully decided to use piggie as a weight when exercising. Notice how she squirms to try and get out of the hold. Most pigs would also be squealing so loud that you instantly put them back down. Thankfully, Reed had a good grip on her, but if he didn't, the outcome could've been bad. A pig falling from this height could potentially cause a fracture to one of the legs, neck or back. First thing, when you go to pick up a pig (or piglet) tuck the feet in so they feel more secure. It's obvious that he handles piggie on a regular basis judging by the lack of vocalization on her part. Otherwise, once you pick a pig up, the pig will likely scream and those screams can be super loud. Hold a firm grip so any wiggling will not result in your dropping your pig and try to build a trusting relationship. Pigs do not like to be held (most of them anyways) its an unnatural position for them to be in, so unless you need to pick them up for something specific, like to put your pig in the car to go to the vet or another chore, once your pig matures, you likely won't be able to lift it anyways, so safe yourself the pain of trying to do it now. Harness train, crate train, those are important, but being able to carry your pig? That's not important. What do I need for a pig? A busy ball will look much like this cat treat dispenser. Obviously you would only put pig approved treats inside. Potbellied pigs are very sensitive to extremes of heat and cold and should be provided a clean, dry, draft-free environment. Adults are usually comfortable in a temperature range of 65 to 75°F (18 to 24°C). Because pigs do not sweat, temperatures above 85°F (29.5°C) are stressful for adults. Extended exposure to high temperatures combined with high humidity may be fatal. Potbellied pigs are more susceptible to disease when kept in stressful environmental conditions. In general, the younger the pig, the more severe the impact of environmental stress. Pigs will need some kind of outdoor shelter in order to keep warm in the colder months and a shaded area to provide relief from the hot sun in the hotter months. In addition to the fenced in yard, most pig families have a "kiddy" pool of some kind or a mud pit where their pig can go to cool off or coat themselves in to protect their skin from the harsh sun. Click here to visit our pages that discuss seasonal issues and common problems during those months. Potbellied pigs are rooting animals and need an area suitable for this behavior. Owners should expect and tolerate rooting in lawns and gardens and/or the disturbance that results when potbellied pigs root in blankets, carpets, or other items inside the home. Using fencing to allow access only to certain areas will minimize damage. In addition, routine hoof maintenance and special dental care are required to keep these pigs healthy. Potbellied pigs do not make suitable pets for apartment dwellers or residents of high-density condominium complexes (they do NOT do well with steps typically), they don't tend to make great house guests, so if you rent a property, please make sure having one is legal and ok with your landlord. Please be sure to get this agreement in writing and remember if you plan to continue to rent and leave the home you're in, you may have a difficult time finding another rental property that allows pigs or one that has a suitable yard/environment. It's best to own your home when deciding to get a pig as a pet. Keep them busy. Potbelly pigs are extremely smart, which means they can get bored very easily. A bored pot belly pig is an unhappy pig, which means they may become destructive or mischievous. Pigs are naturally social animals, and if there is no human or other pig available they like to play with toys. Here’s how to select the right toys (or make your own) to keep your pig entertained and happy. Click here to visit our page that discusses enrichment for your pig. 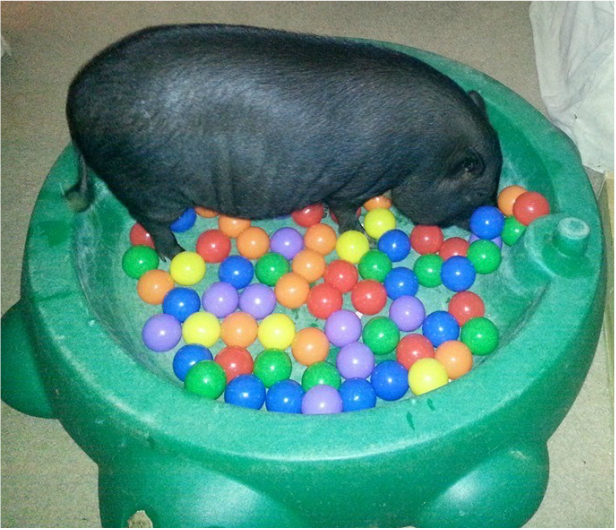 A must-have toy for your pot belly pig is a busy ball. The hollow ball holds treats and/or pig chow and it made of hard plastic. There’s a hole in the ball that’s just big enough for some food to spill out which will provide hours or entertainment for your pet. Baby toys can also provide hours of fun for pot belly pigs. Just make sure the toys are too big for your pig to swallow and they don’t have any parts that can easily break off. Traditional cat toys such as wicker balls and other hard plastic toys are great for pot belly pigs and can be purchased at any pet supplies store. Large diameter PVC piper with thick walls make fun tunnels and hides for pot belly pigs. In the summer time, fill a kiddie pool with water for your pig to play in. It will keep him or her entertained and cool. You can also make a root box for your pot bellied pig. Build a box out of plywood that’s about 4 inches keep and about 2 feet by 2 feet in size. Fill the box with hay and food or treats like Cheerios for your pig to find. Your pot belly pig will love his or her root box because rooting is a natural instinct of pigs.Now that you have plenty of toys for your pot belly pig, enjoy hours of fun playing and building a better relationship with your pet. This is a great example of a rooting box. The "rooting" items are are large enough so that they're not a choking hazard. Small treats can be scattered in this area for hours of fun! • Keep track of a few things, how often does your pig pee and poop? This will help you determine if your pig has a problem later down the line. It will also be useful in potty training. Keep a journal of food you've tried and how your pig reacted to them. Keep track of everything for the first month so you have your pigs baseline. This is the time to think about pet insurance. There aren't many companies that offer insurance for pigs, but click here to see which ones do. • Be sure to get a baseline temperature, you really need to do this over a period of a couple of days in various situations like after waking up, after coming in from playing, after eating or right before bed. This will give you an average and from that you will have your pigs baseline temperature. That way you will know what is a higher than normal for YOUR pig! These things can differ from pig to pig, size to size and area to area...your pig may not be like someone else pig! Temperatures are taken rectally, so please be sure to mark the thermometer with your pigs name and keep separated from your family's medical supplies. • If you have a female pig who isn't spayed, you'll want to keep tract of her menstrual cycles. This will come in handy when you schedule her for her spay, pigs in heat are at a higher risk during the spay procedure and if you can schedule that appointment around her cycle, that would be best. A pig in heat will also run off more frequently to look for a mate. They can become highly agitated and some times don't even like to be petted. They will also frequently urinate and purposefully urinate outside of a litter box when in heat. Click here to read more about the importance of spaying/neutering. • Ensure you have a copy of the vaccination/deworming schedule. You need to know what vet care has already taken place and continue recording for your own records as well. Click here to read more about parasite control. • Remember, you have to build trust with a new pig, even more so if this pig came from a rescue situation where the conditions were less than stellar, this takes time. If your pig does want to come to you, get on their level so they don't have a giant hovering over them, they're naturally scared animals and need to feel safe and secure. Click here to learn the best ways to introduce yourself to a new pig. • Why won't my pig eat the food I got them? Well, it sometimes depends on what feed they were getting before you got them. It may just not be what they were use to. Pigs have 15,000 taste buds, so they like to taste everything, what they don't want to taste today may be their favorite tomorrow. Again, give it time. Introduce new foods one at a time so you get a better idea of what your pig doesn't like. Some pigs will take 24 hours before they feel secure enough to eat at all. They're likely grieving the loss of their mother, brother and sisters, or even their last family depending on how you ended up with this pig. Sometimes you have to entice them to eat, some pigs eat whatever you give them. Again, this will have to be addressed with each individual pig and is not a blanket recommendation for all pigs. Click here for additional FAQ that you may want to know. • Make sure you have a vet that sees pigs. This should be done before you get a pig, but now that you have one, you need to make finding one a priority if you haven't already found one. Make an appointment to ensure the pig is in good health. Take all vet records that you have with you to add to that medical record. Ask the vet about emergency services....we all know pigs don't get sick during normal business hours. Pigs get sick on nights, weekends and holidays, so see if your vet is available during those times and how to reach him/her. Ask them if they have a recommendation of an emergency vet that will see your pig. Also ask about mobile services, will your vet come to your home? Often times it gets more difficult to transport a larger pig and having a mobile vet is less stressful for those pigs who don't travel frequently. There are a lot of veterinarians out there that are part of a livestock vet practice, all the livestock veterinarians usually ARE mobile. As your pig grows, this may be a helpful alternative to look in to. Click here to visit our ever growing vet list. These vets are listed by state and most have been confirmed that they see pigs. The list is enormous, so we cannot call each one every few months to verify they still see pigs. If you come across a vet not listed, please let us know and we will have that vet practice added to the list. Same thing applies if you come across a vet practice that no longer sees pigs, please send us an email and we will have that vet removed from the list. 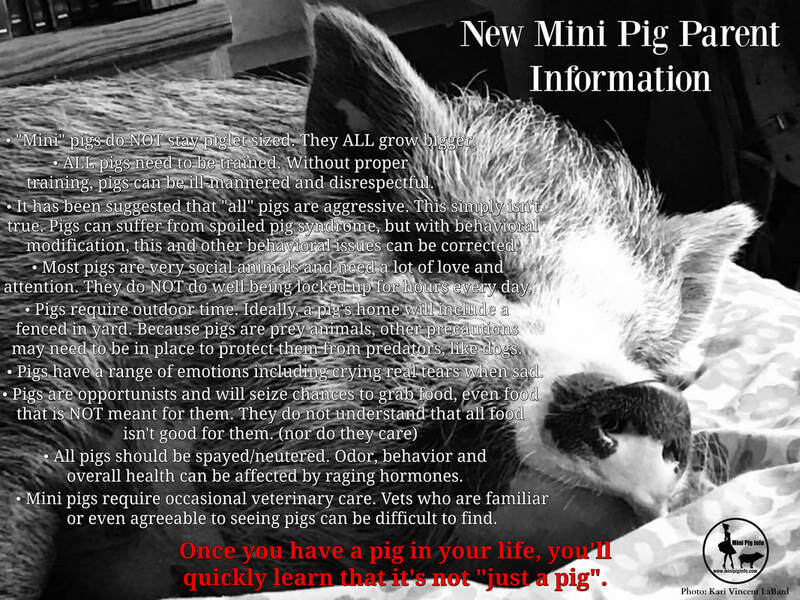 (minipiginfo@gmail.com) Do NOT wait until you have an emergency before you find a vet that will see your pig. Familiarize yourself with common illnesses and diseases so you can quickly identify the symptoms and get your pig to the vet for treatment. You can click here to read more about common health issues. • Frequently touch your pigs face, mouth and hooves. If you make it a practice to do this early, later on when you need to wipe the eyes or trim the hooves, the pig is less likely to be scared or hesitant because its something you've done since the pig was smaller. • Have an emergency plan. What happens if you unexpectedly have to go out of town? Who will watch your pig? What if there is a natural disaster? do you have an emergency kit available for short notice? If you have to evacuate for whatever reason, do you have a place that your pig can go? These are all things you need to research sooner rather than later. You never know when something beyond your control will happen and you don't want to be left scrambling….Click here to read more about emergency preparedness. ~They grind their teeth almost constantly during the day. Non. Stop. Grinding. ~Pigs are not for the hearing sensitive. Their horrific piercing squeal is much louder than you’d ever imagine. ~If you want to hold your mini pig, you need to really work on it. It takes patience, determination and lots of ear plugs to get through the torturous squealing when they are in the air. ~Mini pigs are smaller than farm pigs but don’t expect them to stay “mini” for too long. ~Mini pigs do not like to play, for the most part. It’s all about cuddling and eating. ~They will do anything to get a crumb. They will learn to open cabinets. They will climb into the garbage if they can reach it or rip it open if you make the mistake of leaving the garbage bag on the ground. They will tear apart your cupboards to get one teensy weensy crumb. ~They are much smarter than dogs and cats. ~Because they are so smart, they quickly learn to manipulate you. There is a thin line between rewarding a mini pig with a treat and them knowing how to take advantage of you to get that treat. ~Pigs cannot hold their bladder until they are almost a year old (minus the exception in number 10). They will have accidents everywhere and go back again in the same spot even after cleaned with the strongest enzyme cleaner. So that means gates everywhere. Additional " I wish I knew" comments taken from a FB group post. What you wished you knew BEFORE you got a pig. These are real, loving owners of "mini pigs". Rachael Mitchell Harris says: I don't have much to complain about my babies. When they're outside I yell and they come running. They've been potty trained since day 1; we had a few accidents but not many. They don't chew things, don't stink. They are great at bath time! I just put Cheerios and they love it! To get them to go outside is like teaching a human! Take them out often and reward, I mean like, make it like the Thanksgiving Day parade when they potty outside! I have a box for emergencies. Donna Lyerly says: I wish I had known that many pigs are happiest in pairs. My piggy is an only and he's bonded to humans but I feel guilty that he doesn't have a companion. ~ AND I wish I had been forewarned about piggies blowing their coats. Jessica D'Apice says: I wish I knew you needed lots of PATIENCE.. We got ours on a whim. The first 3 weeks were rough but he is so good. Now. In the beginning we used unsweetened applesauce in his food. And pumpkin too. Cheerios are a must. You will need to get a harness too. It needs to be an A frame one, I ordered online. Get him used to it early. Ours keeps his on he loves to go on the leash. Erica Kaufman says: I wish I knew how different they are from dogs... training and behavior. I wish I knew how smart and bossy they are. Also how big they get. I had no idea until after I saved my guy and joined this group (We love potbelly pigs) But, I wish I knew how different they are from dogs... training and behavior. Ana Christina said: That you can still be allergic to them! Battling eczema everywhere is not an easy task!!! Doreen M. Burke adds: I have learned that having a support system, such as FB pig groups, is vital and helps immensely with trying to be the best piggy parent. I wish I knew that they were so, so different from having a dog. I read books to prepare, but it's just so different when you have one for real. Like anyone can tell you how a baby will change your life, but once you actually have one you don't really know. I wish certain breeders didn't perpetuate the urban legend of a 25 pound mini pig. Apriljean Atwood says: I learned that my life COULD change. I never knew how fiercely I could love an animal that I don't even think of her as an animal. I've always loved my pets, but she isn't a pet. She's my best friend. Destinee Goad I wish I knew they were like two year old all the time. I wish I knew he'd literally destroy any and every toy I give him in minutes. I wish I knew how stubborn he'd be. Mostly I wish I had joined this group before getting him because I was fed a lot of lies by my breeder. I wouldn't give Mooshie up for anything in the world, but I wish I had the information I get from this group sooner so I would have been better prepared in general. Tammy Yancey Swagger says: No all pigs are the same. My Olivia is the sweetest gentle baby ever. Very laid back and lazy. Stephanie however is psychotic sometimes lol. She is sweet one minute then will bite the hell out of you for no reason at all. I have been in tears so many times for those bites. 2 of which were my breast. I still love her and would not give up on her. So start your piggies early with who is THE PIG!!!! Move that pig when she is sleeping. Make her work for those treats. And keep that firm NO when she bites. I have even bit her back on the ear lol. I hope this helps someone. Xoxoxox ps keep them busy. A bored pig will tear stiff up!!! Get them a rooting box and time outside and those cool toys like a BOB And I have a puzzle for dogs with treats inside they have to move with their snouts to get the goodies. Bethany Zajac says: One thing I learned is I didn’t realize how loud they get. and the other thing is at first my baby was kind of hard to take care of he would pee in the house we had multiple boxes for him, he woke up really early in the morning, and I kept thinking I don't know if I can do this for 15 years. I was tired it was like having a newborn type of tired. I wanted to wait it out I thought it HAD to get better, after he turned about a year things started to get sooo much easier. he started to sleep in and he was finally on a schedule. he never had accidents in the house and got to go down to 1 box, and now he is almost 2 and he goes outside only when it’s nice. another thing I learned is how loving they can be. Not just to 1 person but with the whole family. Susan Schooners advice: Three things I wish I would've done are handle his feet more, give him baths more often, and start training him (sit, spin, etc.) at a younger age. Anne Eastin added: Also as much as they may be bad, because we all know that our precious babies can still be little jerks, never ever hit your piggy. Not even a little bit. It's ok to nudge them around by the shoulder and give them a little push on the bum to get them moving but they will remember if you hit them. Stacy Martin says: Keeping one or two outside is much easier and usually makes for a happier pig. Mine come in to wander around or watch a movie, but I never leave them inside when I am gone and they sleep outside. I sit on the back steps and they come up and lay across my lap. I never feed them inside so they don't beg to come in, but they like to come in, then they go right back out when asked, summer or winter. And adds I always encourage people to go visit someone with adult pigs. See how big they are, how they act, and how they are kept. Baby pigs are precious in photos but they don't look like that for very long. I say: Just because you read it online doesn't mean it's true! People will lie about everything. RESEARCH everything yourself! Pigs grieve like people and there is nothing sadder than pig tears. There are no other people like pig people, they truly come together to help one another, they share in successes, failures, the good times as well as the bad times. It's a community effort to educate others and each person tries to do their best at teaching others about pigs. Let me add, I also tell people to quit glamorizing their pigs. Pigs are all sweet and cuddly. Some prefer to be left alone and just be a pig while others love to cuddle. People go in with an expectation that a pig wants to sleep in their bed and lay around just loving on their human pig parents because of pictures people post, don't be fooled. We ALL take only the sweetest pictures and post them, if you saw the 52 pictures we took to get that one shot that was post-able, you wouldn't think you had the only pig that didn't want to be the sweetest pig ever. Brandi Renshaw says: You know when you stop a kid before they do something naughty? "Eeh, don't do that." Then they look right at you and do it anyway. Yup, that's a pig. Jordyn Chance wanted everyone to make sure they knew: make sure you spend LOTS of time giving them attention while they’re young so that when they’re older they are more social. Also the bath thing is a big deal make it fun and rewarding because the first few are scary for you and them. Cathy Campbell said: Never never ever feed them in the kitchen. If possible and you have a garage feed her there. Ours has never eaten in the house and she doesn't beg for food. Also, they do not like strangers in their house, if you ever want to go on vacation again, start now getting them used to who ever will come over to take care of them. Ana Garcia said: Pig feed only, don't feed dog food, it makes them FAT very quickly. Pigs don't need banana peels, apples, and fruits every single day as much as they want. Everything healthy in moderation is great and teach everyone in your home or even visitors not to feed your piggy junk food. I did not know there was pig food and thought pigs could eat anything and everything and my mom was feeding her junk food (ice cream, cookies, cereal, rice, left over McDonald's and so much more) plus, I'd train to go potty outside because if in the end that is what you are looking for, its a little harder to break the habit of going potty inside. It can be done but just more work. Take LOTS of picture because they grow FAST, do lots of snuggle time, get your piggy use to baths very young and use to hoof trimmings very young as well. ENJOY your new baby. ‪Acacia Creech‪ says I wish I knew piggies can be so hard headed! Julie Duckworth‪ states I wish I'd known how addicting they are. They have such a wide range of emotions and are very capable of showing them. Like they can speak without words. They make you earn their love, not just giving it to anyone. Annie Eastin wishes she knew that when they find the dog food, its the fight of your life getting them off of it. And, they never forget where it is! Teresa Alleva says‪ I wish I knew NOT to feed off my dish when they were little! Kathy Metcalf Pozywio‪ adds I wish I would have known how much they love clothing. Perhaps they like your scent on the clothes and find it comforting. I have lost many clothes, only to find them in his nest. Angie Lord Collins‪ I wish I knew how mind-blowing fantastic they were years ago, I wouldn't have waited so long. Michelle McKean‪ stated I wish I knew how busy they are as piglets-they never stop moving. I am constantly chasing her down during the day. Until dinner, then we have to have our after dinner snuggles. She demands it. Bonnie Chandler‪ says I wish I had known how much I would love them, earlier in life. So much time lost. Pigs not only form bonds with their family, they also form bonds with people who come to their home occasionally. This is Larry the pig who is super excited to see Ernie, a delivery driver for UPS. Posted with permission from Larry's mother, Katherine. Always be prepared for the worse possible scenario and hope for the best. There are times when a pig is sick and you need to get them seen by a vet. This will likely be on a weekend, holiday or after normal business hours. Have an emergency vet on speed dial. Ask your vet if they do home visits or "farm calls". If they don't, find an emergency vet that will see your pig in the event of an emergency. How do you load a 150b pig in your car to get this pig to the vet? Well, I recommend pigs be crate trained for this very reason. Its much easier to load a crate than an unwilling pig. If your pig is harness trained, then walk them out to the vehicle. If you have a car/SUV that your pig isn't easily able to climb in to, there are options for that as well. Tractor supply sells mounting blocks, also known as steps that are the perfect height for a standard sized SUV. You can also buy or make a ramp of some kind so your pig can easily walk into the vehicle to be transported to the vet. You will want to have these things in place BEFORE an emergency. You will also want to train your pig to use these BEFORE an emergency. Click here to learn more about emergency preparedness. If you have an unwilling pig, there are methods to help you to get your pig moving in the direction you need your pig to go as well. A sorting panel is the easiest thing to use to guide your pig into a particular direction, sometimes a couple of them are needed along with a couple of people to move a pig that doesn't want to. Debilyn McPhate says: For those of you who have pigs that are difficult to load, especially sanctuaries need to have a pathway of hog panels held up with lots of strong t-posts, that opens to where a pick up can back to or trailor or a van can drive to and opens on its side. Then have a ramp that goes into the vehicle that holds on and folds up. This way, you can always walk piggy to pathway to have snacks, get behind them with a board and walk them to ramp. The only way they can go is forward. you don't make it wide enough for them to turn around. Information collected and written by the mini pig info team unless otherwise noted. The animal control caption for the pictures they posted: This poor pig was kept inside a VERY small trailer/shed. The floor was ankle deep in muck - feces, urine, rotten food, stagnant water- and when the door to this living hell was opened, the slime and muck literally poured out of the enclosure like a waterfall. Lollipop was living in her own filth for years, with no escape, no relief. She deserves a real home. One where the needs of an intelligent, social creature are understood. She needs to feel the sun on her back and have nourishing food fed to her daily. Lollipop is actually very underweight for a pig her size, and she is filthy. We are offering her a pool with soapy water in just a bit to allow this poor pig the chance to finally be clean!